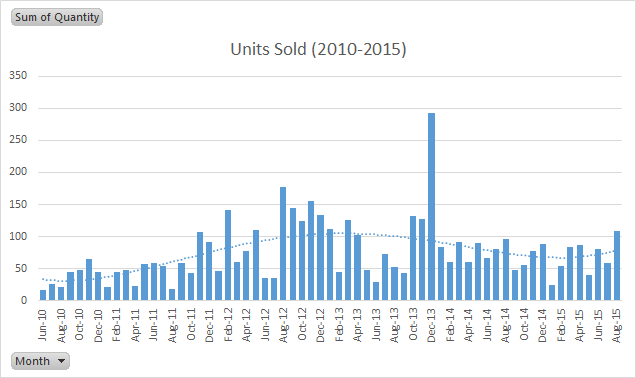 Even though I don’t write gaming stuff for a living (thank God), I do keep track of sales. I didn’t enter publishing thinking I would make a fortune, but I do like to stay profitable – as long as I’m not losing money, I’m generally okay since I enjoy writing. I started publishing in June 2011, with NOD #1. 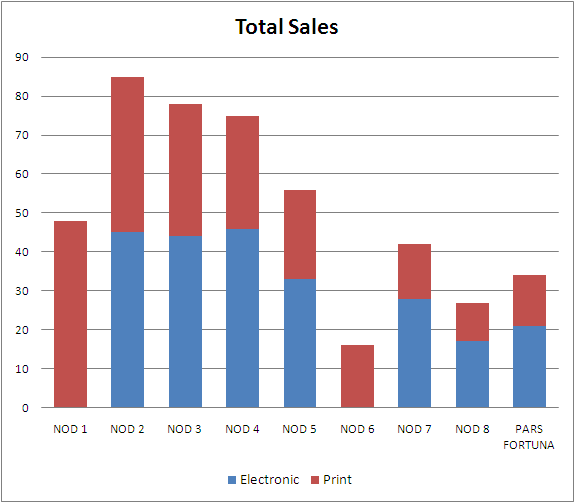 Overall, sales peaked in in 2012/2013, and may be increasing again in the last few months … maybe. 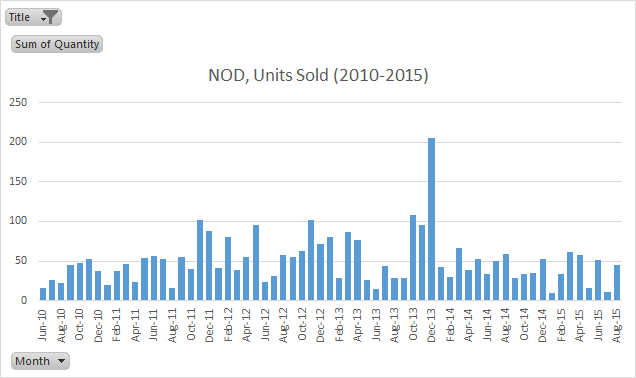 Just for the sake of reference, I’ve sold a total of 4,743 units of everything I’ve ever published (not including free downloads of a couple issues of NOD) on Lulu.com. Breaking things down a bit, we see that sales have generally fallen off for most products over time. This doesn’t bother me too much – I would expect sales when a product is brand new to be stronger than months or years later … though of course, I would be very happy if they were stronger. Blood & Treasure will get a new “edition” next year – mostly a redesign and correction of mistakes, nothing drastic (though I will be ditching the half-orc and all the demons and devils … just kidding). NOD Companion did reasonably well, but not great. 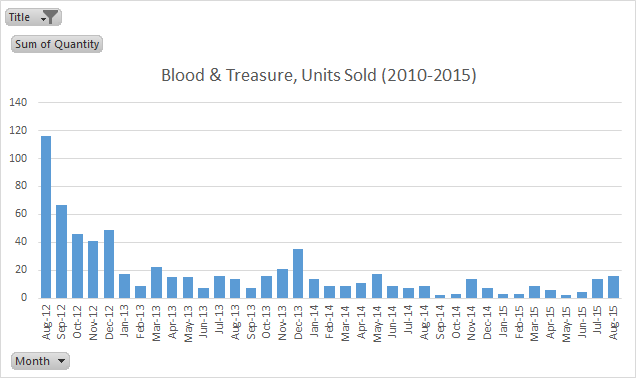 Monster Tome sales have been weak, and it was an expensive book to do due to the art costs involved. 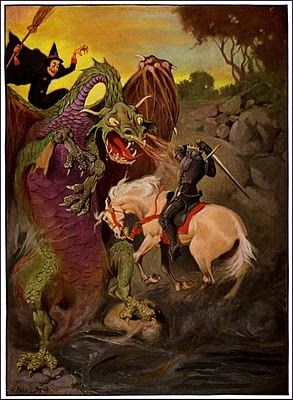 Oh well – I still think a proper fantasy RPG should have at least one monster book. 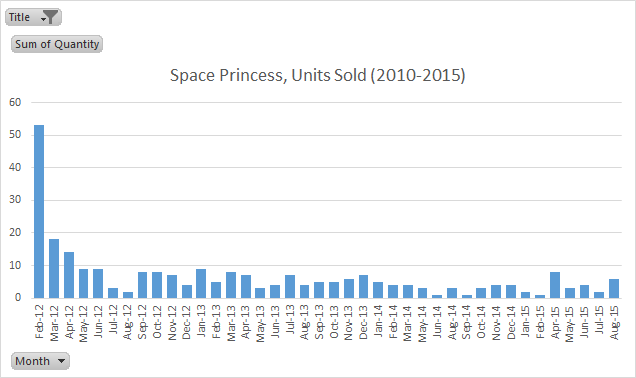 I was going to do a Pars Fortuna B&T edition, and bring Space Princess into the Grit & Vigor fold when I publish that later this year, but now I might not. Their sales are steady, and there may be no reason to mess with them other than to improve the quality and correct mistakes. I might also go for a 6×9 format on them. I didn’t include a Mystery Men! chart above since I haven’t been able to sell it for the last couple years (dangit). Not a canny business move on my part, but hey – live and learn! 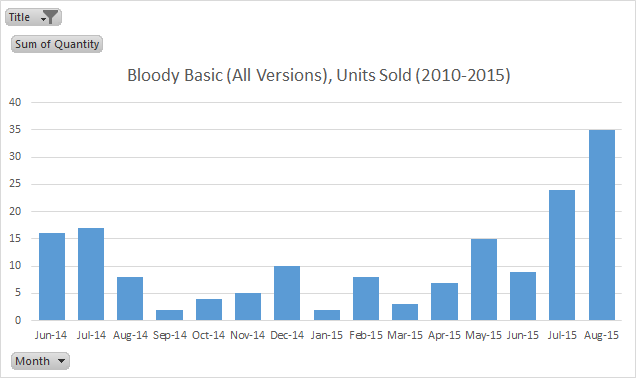 Bloody Basic seems to be on the upswing, and I enjoy making them, so I guess I’ll continue. I think the inexpensive mini-games I’m working on might also do well. It’s even more pronounced. 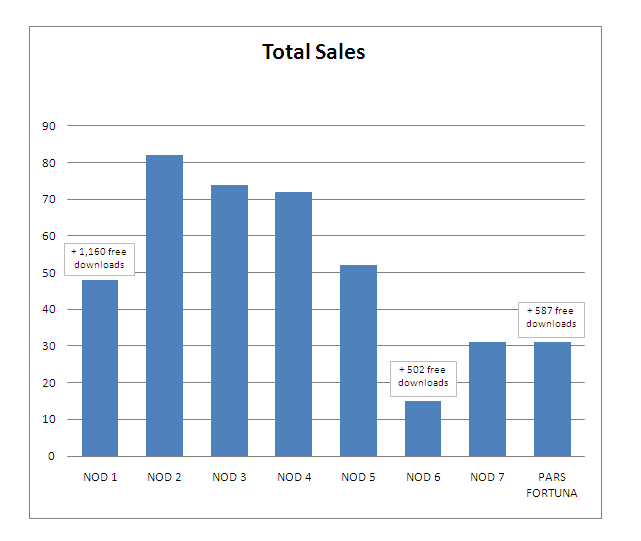 NOD 1 and NOD 6 are free PDF’s, so those sales can be ignored. What can’t be ignored is the overall trend. NOD 25 and NOD 26 are still pretty new, but they have not reversed the trend. Worse yet, with the last 2 or 3 issues, I’m losing money on the magazine when art costs are tallied in. 1) Stop making NOD. I could do the hex crawls as stand alone products and just blog the rest of it. Not a bad way to go, and in fact I’ve really thought about doing this. I would also revise the older hex crawls. I might even go for a “vague OSR” rule set for them, rather than B&T. 2) Improve the product. God knows there’s room for improvement, both in terms of design and content. 3) Stop publishing. Magazines don’t last forever, and 26+ issues of a self-published magazine ain’t too bad. My choice – Option 2, with Option 1 as a back-up plan. I’ve already played with a new look for the covers, and I’m committed to getting NOD onto DriveThru/RPGNow so it gets more exposure. I also want to bring more contributors into NOD. It’s been me by myself for way too long. I want it to be more of a community magazine than just a solo project moving forward. The problem: If I’m selling hundreds of copies, paying folks for submissions is not a problem. If I’m doing a fanzine that isn’t designed to make a profit, asking for free community cooperation is not a problem (getting it might be, but asking is okay). I’m somewhere in the middle. It is a for-profit enterprise, but it ain’t that profitable. What to do? 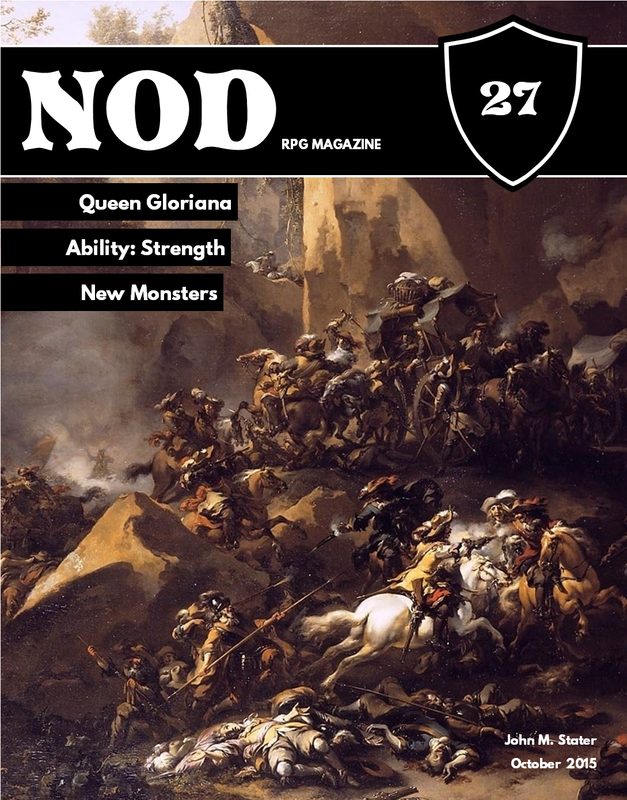 If you would like to contribute something to NOD (system-neutral, or any system which I can cover with the OGL) – and I would love to have you do so – I can pay a flat $10 per page (after layout), plus a free PDF of the magazine, plus a free advertisement in that issue (or, if you have nothing to advertise, a free PDF of anything else I’ve ever published). I’ve been asked if I would accept maps as a submission, and my answer is yes. New adventures (dungeons and wilderness), new spells, new monsters, new rules hacks or ideas, NPC’s, mini-games, war games, comic strips, art, etc. 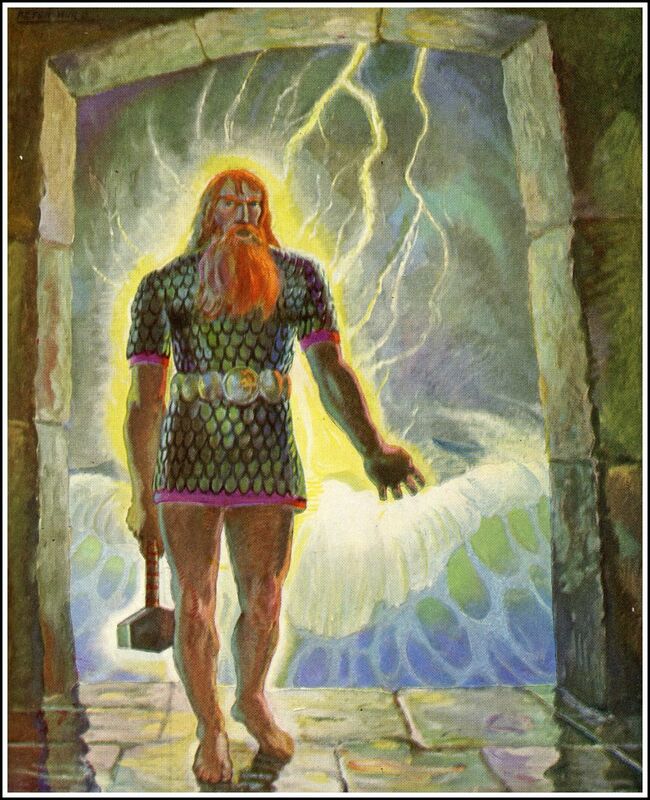 Any genre is cool with me – fantasy, historical, science fiction, pulp fiction, modern, etc. I’m going to try this scheme starting now, with NOD 27 (which I hope to publish in late-September, early-October). If this seems to turn around sales and gets me back to where I’m not losing money on the deal, then NOD lives! Just an FYI for those who are interested, it looks like the first two Hex Crawl Chronicles that I wrote for the Frog God are now available for sale as PDF or soft-cover book. The hex crawls are produced in two versions – one for Swords and Wizardry and the other for Pathfinder. Obviously, if you would like to buy a copy of each for their historical significance, I won’t complain. When the northern men came into this land they thought they had discovered a place of limitless possibilities – sparkling streams, fertile valleys and endless acres of rich timber. They didn’t realize they would have to contend with giant beasts, rapacious lycanthropes and the mysterious black arcs that visited the land from beyond the Black Water. 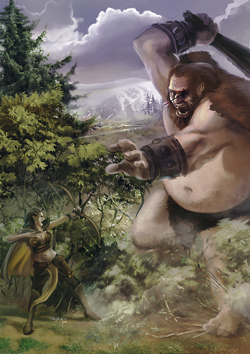 Strike out into this land of dire wolves and giant badgers – bring news and trade to the isolated colonies of the northern men or fight through the lands of the wolfmen to find the palace of the mythical Queen of the Winter Wind. What a busy month! 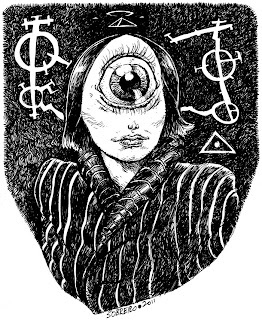 Finally got NOD 8 published early in May (and late – God how that galls me) and Mystery Men! is now a reality – at least electronically. I haven’t yet received my print copy from Lulu.com, and I’m just a wee bit worried about how it will look in black and white, so I’m holding off on making it available for sale as a print book until I can see it with my own eyes. 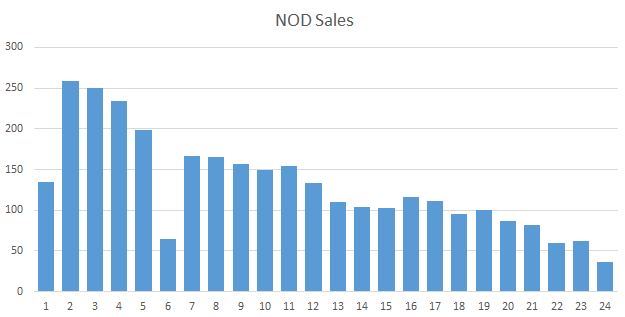 Sales were pretty good in May – I think NOD 8 has moved faster than most previous issues of NOD. Page views on the blog seem to have moved into the “usually more than 300 a day, sometimes more than 400 a day” territory, which is nice. Total page views for May were 12,084. 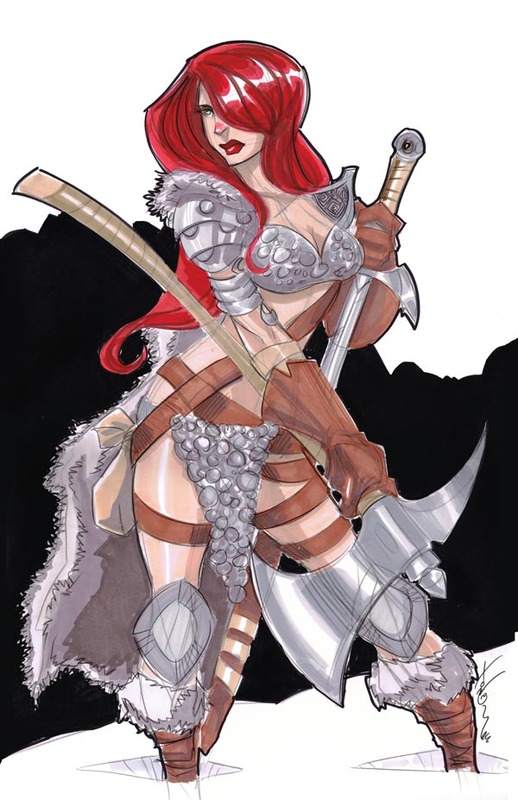 My favorite pic on DeviantArt in May was a tie between Ron Salas’ Ben Grimm 6×6 and Paul Renaud’s Dejah Thoris. 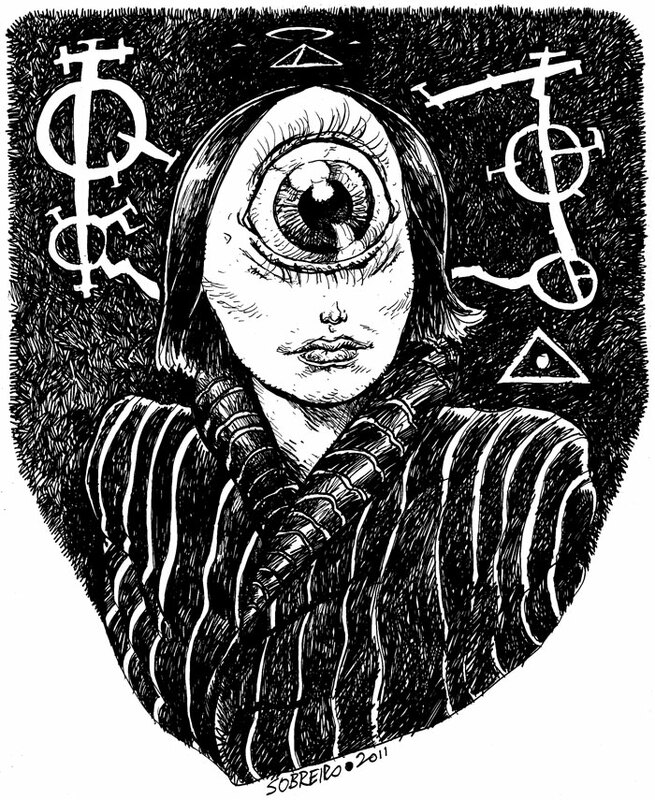 So – working on NOD 9 and another Hex Crawl Chronicle (the new name, I think). Have fun on the internet! 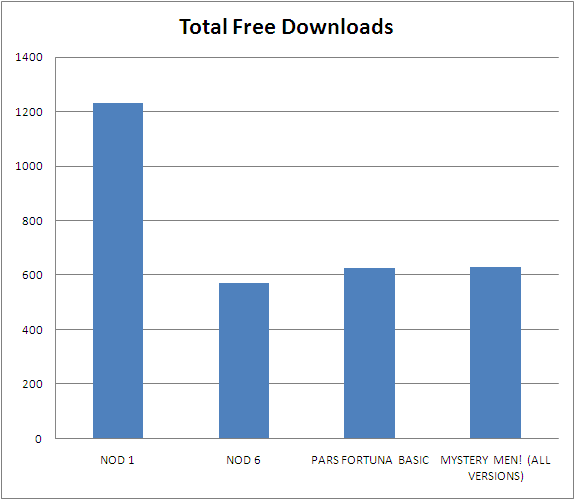 I shifted 21 units in April and had 244 free downloads. Page views for April were 10,418, with a nice boost coming from a link from Zak. Also, I managed to forget my blog anniversary in March – thankfully I do better remembering my wedding anniversary. Thanks for a year of page views and comments (keep ’em coming). 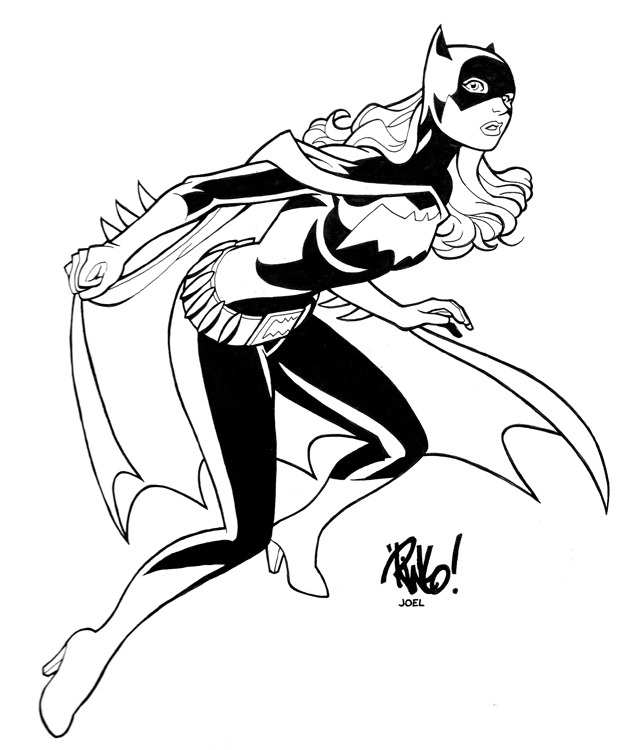 Favorite pic on DeviantArt in April was Joel Carroll’s inks on a Wieringo Batgirl pic. Oh – and before I forget – NOD 8 goes on sale tonight if Lulu cooperates (and she hasn’t so far today). In either event, it’s at least finished. Mystery Men! 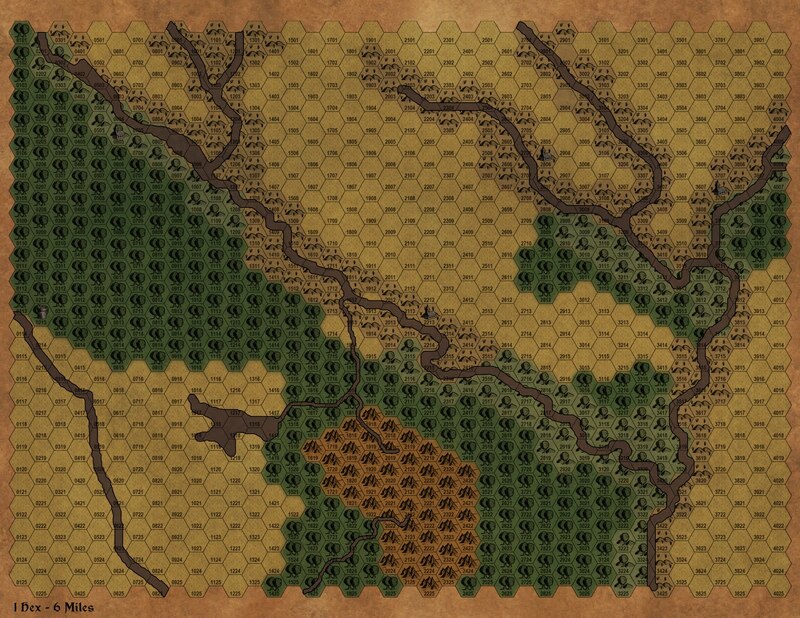 is almost completed – I’m just writing up the encounter areas for the sample adventure. I hope to get it out there in one or two weeks. How did I do in February 2011? February was bery, bery good to me. Sales were pretty good at Lulu, and I managed a second straight month with 10,000 page views or more on the blog. How did I do in January 2011? It’s a new year and things keep plugging along. Mystery Men! is floating around in open playtest land, with a few blog posts on the subject these last few weeks and – hopefully – some live playtesting by yours truly if I ever get around to inviting people. I knocked out three city-states for NOD 7 – putting the final touches on them today – and have a few more articles to finish up for its publication in a couple weeks. I’ve also been working on some more Hex Crawl Classics for the Frog God (cover preview for the first to your right), and another project that I’m just pleased as punch about. All in all, February should be a busy one in terms of writing. How did I do in 2010? Wow! In May of this year, I started blogging. 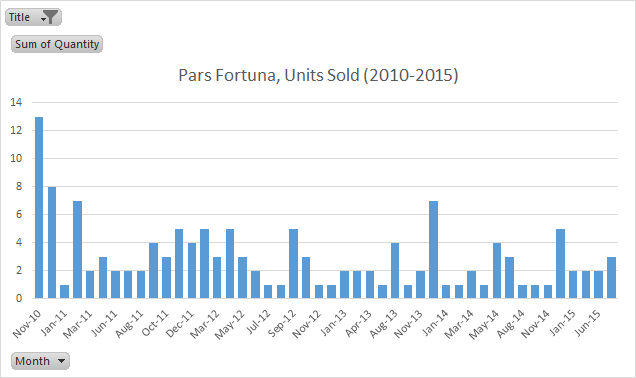 By December, I’ve written 361 posts, published 6 issues of NOD and a goofy little RPG called PARS FORTUNA. The point – if you want to write and create, do it. To paraphrase Sesame Street – it doesn’t matter if it’s not good enough for anyone else to sing, just write – write a game. How did I do in October? Another month down, and a busy one at that. 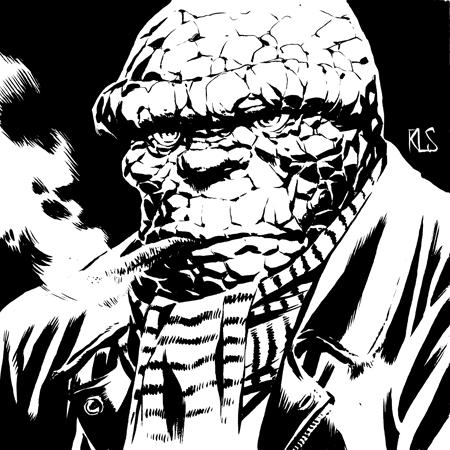 Right now I’m working on NOD #6, which will be a free PDF download as well as a print-on-demand product. In a couple weeks I should publish PARS FORTUNA (finally), and I’m working on Mystery Men! and another Hexcrawl Classic for Frog God Games. October was a pretty good month for sales, but a bit down on pageviews. Not surprising, though, as I didn’t post as much in October as I did in past months – partially because I took a vacation, but also because I’m spending more time on publishing projects than I was in the past. The main thing for me, though, is that I’m thoroughly enjoying both the blog and the publishing, and want to thank everyone out there in internet land for making all of this possible! 4. Random Thought – Character Survivability & Game Design (130) – This one almost went to a bad place. 5. Where Is Your Gamma World? (128) – Always nice to hear where other people find their inspiration. Art by J. Allen St. John via Golden Age Comic Book Stories. How did I do in September? 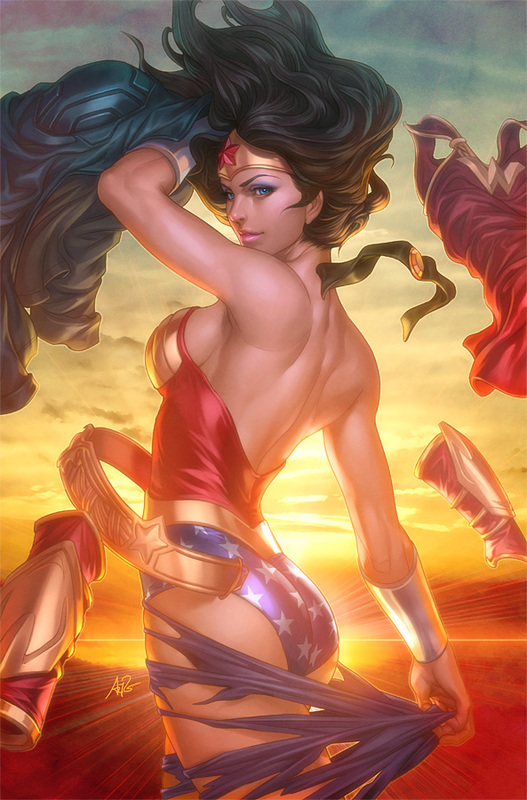 Wow – September is done! For me, this has been hell-month for writing, and I’ve just about completed everything I hoped to complete. Over the next week to 10 days I’m going to put together NOD #5 and get it out there for sale, I’ll have my play test session of PARS FORTUNA and then work hard on releasing it in November (free basic book, non-free advanced book), and I’ll continue to putter around with Mystery Men!, still aiming to release it in January or February of 2011. 4. The Unpublishables (129) – The post that helps answer the question – could Rom and a dozen sand people take out a dalek?